Slideshow Overview: Will a Robin Choose Your Neighborhood? Will a Robin Choose Your Neighborhood? A male robin wants the best possible territory for his mate and babies. What does he look for? What takes place on a robin's territory? 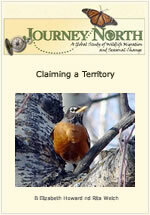 What does a robin look for when choosing a territory?